those who are actually faced with the prospect of an ICC arbitration. As far as possible, the book is structured so as to follow the sequence of events that would typically take place in the resolution of a dispute by arbitration. Following a discussion of preliminary matters, the authors go on to describe the process leading from negotiation to arbitration, the initial decisions that may be taken by the ICC International Court of Arbitration, and the different steps in the proceedings before the arbitral tribunal. The book concludes with a discussion of the award and its enforcement. Extensive references to relevant books, articles, websites and other resources as well as a comprehensive glossary further enhance the book’s practical value. Note Concerning the Applicability of the 2012 Version of the ICC Rules. 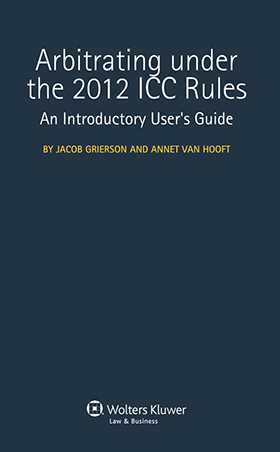 Chapter 2 Key Innovations under the 2012 ICC Rules. Chapter 3 Why Choose ICC Arbitration?. Chapter 4 How to Draft an ICC Arbitration Clause. Chapter 5 The Different Actors in an ICC Arbitration. Chapter 6 Negotiation and Mediation. Chapter 7 Pre-arbitral Requests for Interim Measures. Chapter 8 Filing a Request for Arbitration. Chapter 9 Responding to a Request for Arbitration. Chapter 10 Joinder of Additional Parties. Part III Initial Decisions by the Court. Chapter 12 Place of the Arbitration. Chapter 13 Consolidation of Arbitrations. Chapter 14 Constitution of the Arbitral Tribunal. Chapter 15 Advance on Costs. Part IV Procedure Before the Arbitral Tribunal. Chapter 16 First Steps Taken by the Arbitral Tribunal. Chapter 17 Interim Measures Applications. Chapter 18 Written Submissions, Exhibits, Witness Statements and Expert Reports. Chapter 20 The Evidentiary Hearing. Chapter 22 Challenges to and Replacement of Arbitrators. Chapter 23 Making the Award. Chapter 24 Correcting and Clarifying the Award. Chapter 26 Enforcing the Award: the New York Convention. Annex 1 2012 ICC Arbitration Rules. Annex 2 Model Request for Arbitration. Annex 4 Model Request for Joinder. Annex 5 Model Terms of Reference. Annex 6 Model Procedural Order No. 1. Annex 7 Model Document Request. "The guide concludes with one of the most comprehensive sets of annexes that arbitration novices could hope for. These include the new rules themselves, followed by a model request and answer with each author playing the role of opposing counsel in a mock case. Sample requests for joinder, terms of reference, procedural order and document request follow, thus making this book a very helpful companion in an ICC arbitration." "The authors have devised this book to be used in various ways according to the reader’s need. With its elegant drafting, didactic approach and concise explanation, this is unlikely to present any serious difficulty." "Presenting Arbitrating under the 2012 ICC Rules as a beginner's guide to ICC arbitration, as its authors do, is obviously an understatement. This is a masterly-drafted, authoritative guide to ICC arbitration and deserves to feature prominently on the shelf of arbitrators, counsel and users alike." Reviewed by Georges Affaki, head of structured finance legal affairs at BNP Paribas Corporate and Investment Banking in Paris and published in Global Arbitration Review August 2012. "The book is written in such a way that it can either be read quickly in its entirety, for an overall understanding on how ICC arbitration works, or specific parts can be read on their own to obtain rapid answers to specific questions." "Overall this book provides a good practical analysis that will be of great help for both practitioners and non specialists in the area of international law and international arbitration, students and academics."